We have stocked the GelPro anti-fatique products for more than 10 years now, but just this year, we have revamped our selection. We now offer new sizes, new colors, and new styles. We urge you to take a look the next time you are in. These anti-fatique mats are great for any areas that you stand frequently, such as in front of the kitchen sink or stove. They are also very popular for bathrooms, garages, and workshop areas. 1. GelPro Elite: These mats are 50% thicker than the classic GelPro mats, since they offer TWO layers of comfort (one layer of proprietary gel and one layer of energy-return foam)! 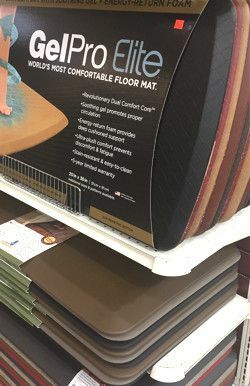 The combination creates the most comfortable floor mat that you can buy. We like to recommend this anti-fatique mat to those looking for maximum support and plush comfort. It is great for those that experience discomfort and fatique when standing for short or long periods of time. 2. Designer Comfort Series: These mats provide great comfort at an exceptional value. The thick 3/4" of ergo bounce-back foam will not sag or bottom out like cheap, imported mats. Available in various colors and sizes, all of these mats have a durable, stain-resistant, poly-urethane top coating and non-slip backing. 3. NewLife by GelPro: These are the premium 100% foam option from GelPro. They offer superior resilience and pushback memory so that it restores energy while also relieving fatique and discomfort caused by standing for extended periods of time. Available in various colors and sizes, and comes with a 10 year warranty.